Hi Everybody! Robert is back this week with some more one-hit wonders for us. Before we jump into this, here is reminder: For the purposes of this series, a One-Hit Wonder is an artist who only had no more than 1 song break into the Top 40 of the U.S. Billboard mainstream chart. Some of these artists may have had hits on other charts, or in other countries. Now, let’s jump into this. We have a good one to start us off this week! Take it away, Robert! Yep, I’m back with five more One Hit Wonders. I mentioned last week that I narrowed my list to twenty-five – it has expanded. Spending so much time revisiting these songs has caused me to once again be transported to the best era of music ever. Some of these One Hit Wonders are so good! I fully stand by last week’s choices – yes, even Jack Wagner and will do the same for the week’s. So sit back, relax, push play and enjoy these (some of these) one time overplayed songs, that have become seldom heard classics of the ‘80s. Unfortunately, Jeff Healey succumbed to cancer in 2008 leaving behind an excellent catalog of fantastic blues rock music. “Angel Eyes” is his only AT 40 hit so he does fit this category of One Hit Wonders, but his music is way bigger than that. Waterfront are the British duo of Phil Cilia and Chris Duffy. They released their debut album, Waterfront, in 1989. The album was successful in the U.K. and U.S. Their hit single from the album, “Cry” hit #17 on the U.K. charts, and went all the way to #10 on June 17, 1989 in the U.S. They followed up with the song “Nature Of Love“, but it was not as successful. They were named BMI Songwriters of the year in 1990. In 1992, Chris Duffy released a solo album which had three tracks co-written with Phil Cilia. In May 2000, Duffy and Cilia reunited as Waterfront, and are still together. In November 2011, they released the album Ghosts Of The Good. They have yet to score another top-40 hit in the U.S.
Jimmy Harnen is a singer, songwriter and drummer from Plymouth, Pennsylvania. He was the drummer for a local band named Synch, made up of lead vocalist Lou Butwin, guitarist Dave Abraham, bassist James A. Donnelly, and keyboardist Chuck Yarmey. In 1985, Synch recorded some of their songs, with Harnen singing on one song, “Where Are You Now?”, which he cowrote with a friend named Rich Congdon. The band decided to release it as a single on the independent label Micki Records. The song got local airplay, and scored a record deal with Columbia Records. They re-recorded “Where Are You Now?”, and released an album, Get the Feelin’ in 1986. “Where Are You Now?” reached #77 on the Billboard Hot 100, but fell off the chart the following week. Synch was soon dropped from Columbia. They spent the next few years trying to recapture the spotlight, before disbanding. However in 1989, “Where Are You Now?” resurfaced and began to get a lot of airplay. With the song now credited as ‘Jimmy Harnen with Synch’, it began to grow in popularity, and it shot all the way up to #10 on June 10, 1989. As the song was climbing the charts, WTG, a new label at the time, signed Harnen as a solo artist. Jimmy Harnen’s debut album, Can’t Fight The Midnight, featured well-known studio musicians including future-American Idol judge Randy Jackson (bass), Toto’s Steve Lukather (guitar) and a guest appearance by one of Harnen’s idols, REO Speedwagon’s Kevin Cronin. The album and tour flopped and Harnen spent the next couple of years releasing occasional songs and tapes until his move to Nashville, Tennessee. Harnen is no longer a recording artist. However, he is now president of the label Republic Nashville. Artists on the label include The Band Perry, Eli Young Band, Sunny Sweeney, Fast Ryde and SHEL. One 2 Many was a Norwegian band consisting of Dag Kolsrud (keyboards), Camilla Griehsel (vocals) and Jan Gisle Ytterdal (guitar). They only released one album – 1988’s Mirror. The single “Downtown” was an immediate success all over Europe, reaching #1 in Norway. In the U.S., the song peaked at #37 on May 20, 1989. The success was very short-lived as the band split up as the promotion of the album was still underway. Kolsrud went on to join the band Guys in Disguise, after which he pursued a solo career. He later became A-ha’s world tour musical director. Griehsel met UK singer Colin Vearncombe from the band Black and married him in 1990. Deon Estus is best known for being the Wham!’s bass player, and was the bass player on George Michael’s first two albums (Faith and Listen Without Prejudice Vol. 1). Deon also played with a few people you may or may not have heard of – Marvin Gaye, Tina Turner, Frank Zappa, George Clinton, Annie Lennox, Edgar Winter, Aaron Neville, and Elton John. Jealous yet? In 1989, Deon Estus released his first solo album called Spell. George Michael produced some of the tracks from the album. The album’s title track hit #11 on the Adult Contemporary charts, but did not charton the main U.S. Billboard chart. But it was Deon’s single “Heaven Help Me” that became a smash hit. It peaked all the way at #5 on April 29, 1989. George Michael also provided the backing vocals on the song. Deon Estus is still playing, and will be releasing an album called Only Love Is Real, and has released the title track on his web page. Kon Kan was a Canadian band formed in 1988 in Toronto, Ontario. They released their debut album, Move to Move. “I Beg Your Pardon” was released as the first single off of that album, and became a hit in many countries, including landing at #15 on March 11, 1989. The song samples of other songs, including Lynn Anderson’s 1971 hit, “(I Never Promised You A) Rose Garden”, as well as samples of GQ’s “Disco Nights (Rock-Freak)” and Silver Convention’s “Get Up and Boogie”. The band was awarded a 1990 Juno (Canadian Grammy) for the song. Kevin Wynne, who was the lead singer of the group, left after the debut album. Barry Harris (vocals, keyboard, guitar) released two more albums under the band’s original name. But they were never able to generate another hit. Harris gained his greatest post-Kon Kan popularity as half of Thunderpuss, collaborating with DJ Chris Cox. Together, they produced and remixed dozens of dance hits including “It’s Not Right but It’s Okay” by Whitney Houston. The New Bohemians started as a three-piece band in Texas. In 1985, Edie became the singer after being encouraged to join the band onstage during a show. They released their debut album, Shooting Rubberbands at the Stars in 1988. The song “What I Am” was released as a single off of this album, and peaked at #7 on March 4, 1989. It would go on to be their only hit song, and ranked #77 on VH1’s list of The 100 Greatest One-Hit Wonders. Following the release of their 1990 second album Ghost of a Dog, Edie Brickell left the group, and would marry Paul Simon in 1992, and are still married. Edie has gotten back together with The New Bohemians. Their most recent album was 2006’s Stranger Things. Canadian group, Sheriff released their self-titled debut (and only) album in 1982. “When I’m with You” was released off of the album, and made the top 10 in Canada in 1983, and only reached #61 in the U.S. The album was very good, including some very good songs like “You Remind Me” and “California“. However, the band broke up in 1985 before they could release another album. Then in 1988, a disc jockey in Las Vegas began playing “When I’m with You”, and other stations followed. This encouraged Capitol Records to re-release the song as a single. On February 4, 1989, “When I’m with You” hit number one in the United States. They were able to do it without releasing a music video! 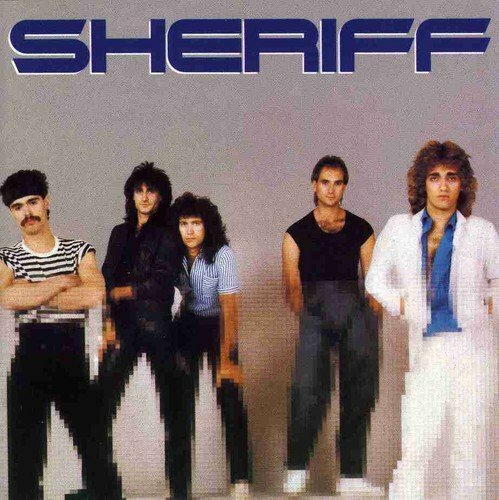 This prompted Sheriff lead singer Freddy Curci and guitarist Steve DeMarchi to try to reform the band. But Lanni and Hassel declined, and continued to work with Frozen Ghost until they split up in 1993. However, Curci and DeMarchi started a new group called Alias. Alias had a successful 1990 debut album scoring hits with the power ballad “More Than Words Can Say” (#2), as well as “Waiting For Love” (#13) and “Haunted Heart” (#18 on Mainstream Rock Charts). They also recorded the song “Perfect World” for the Christina Applegate film, Don’t Tell Mom The Babysitter’s Dead. Then, like most of our favorite ’80s rock bands, Alias faded away when Nirvana and the rest of the grunge movement took over rock music in the ’90s. So, let’s Return to the good ole ’80s, hold up our lighters, and listen to Freddy Curci’s soaring vocals in Sheriff’s smash hit, “When I’m with You”. Before Boys Club, Gene Hunt was a member of the family group, The Jets. Boys Club was the first group to appear on the New Mickey Mouse Club as a musical guest during the first episode.